September 10, 2016. Yankee #109 has been SOLD. We got the following from Terry, and stand by for the new owner to check in. Webmaster Note October 16, 2016 - Joe Wilby checked in as the new owner of #109. Click here to go there. 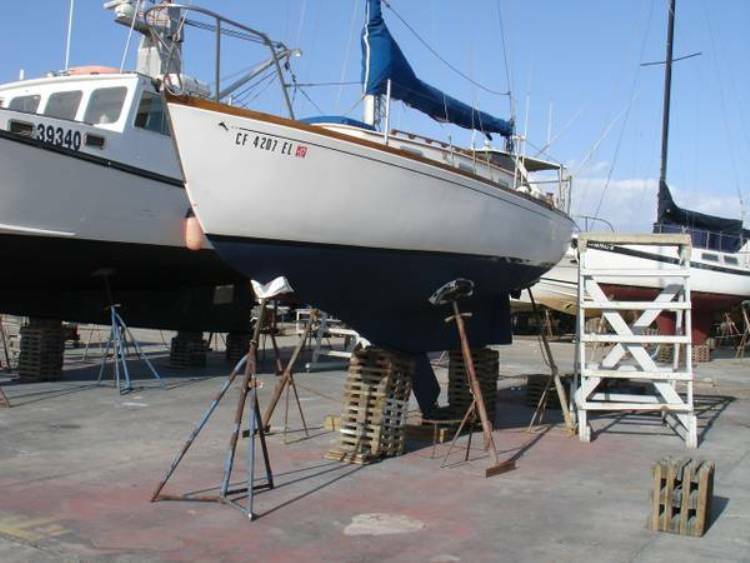 Yankee #109 was sold last week to a lifetime sailor. I am sure he will be check in soon with you. August 10, 2016. Well, it took 8 years but we've come full circle - #109 is again For Sale. Here's Terry's email, the Craiglist ad and link, and photos. 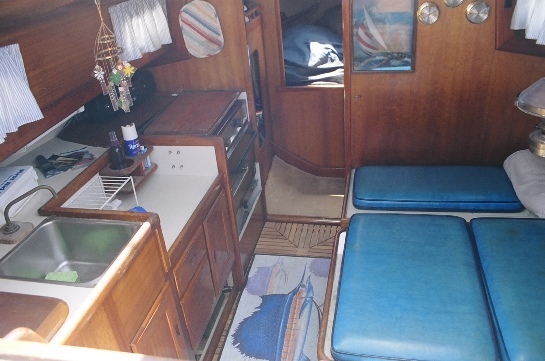 life lines replaced, VHF Radio, Anchor, life vest, safety equipment and more included. 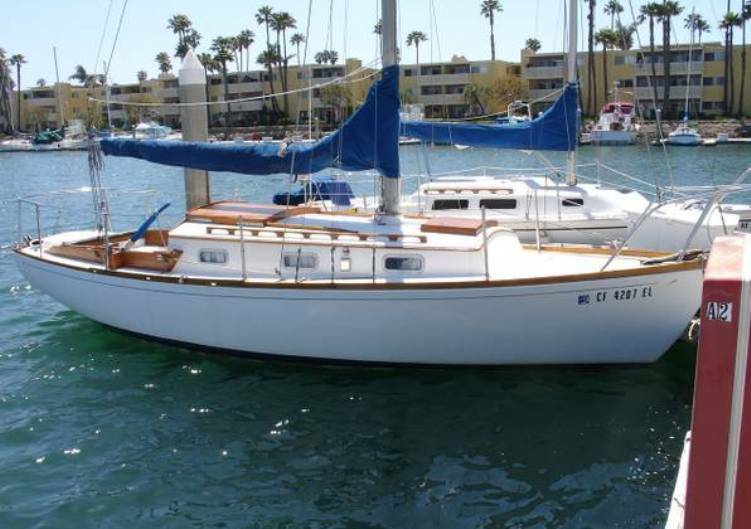 March 27, 2008 This beauty was for sale but Terry decided to keep sailing her instead. After buying a new motor and feeling that need to go sailing. We have decided not to part with her at this time. Hope to use her for a few more seasons. You could remove her from your Dolphins for Sale. Thanks for showing her on your web site and look forward to checking in once and a while. Terry has had her for 15 years. Her list of equipment from the ad specs is below. Terry sent in the following email with some interesting history about #109, and a couple of more pictures. Thanks for checking the status of my Dolphin. When I received your E-Mail I thought you were a prospective buyer. Took a look at your Dolphin and I think she is about the best I have ever seen. 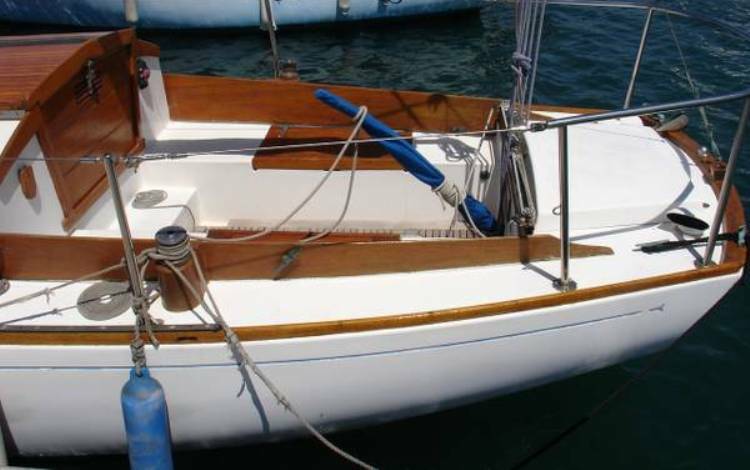 I have had a couple of people show interest in my boat who found her on your Website. One from Tennessee, and Erick Evens (west coast investigator). Erick and his wife spent some time checking her out and taking photos. It’s funny what a small world we live in. Sunchaser and Blue Dolphin were the first Dolphins to catch my eye about 17 years ago. That was the start of my two year search for the boat I have. I bought her in a slip in Marina Del Ray from a man who lived in San Diego - first name Donavon. He used her for day sailing and a place to stay while on business In LA. 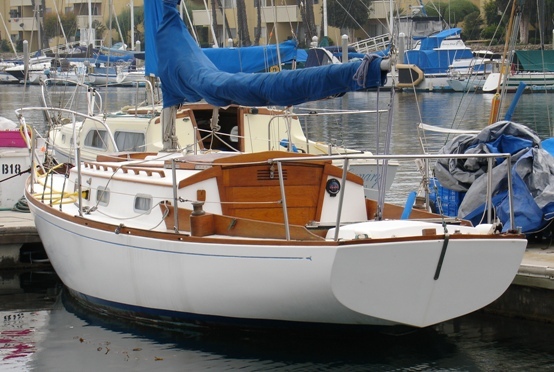 He bought her from a man in the movie industry who lived on her and spent a good bit of time sailing around Catalina Island. 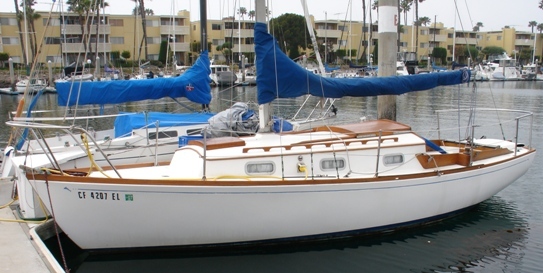 While I had her in Marina Del Rey my wife, friends, and I would spend weekends sailing Santa Monica Bay north of Marina Del Ray. 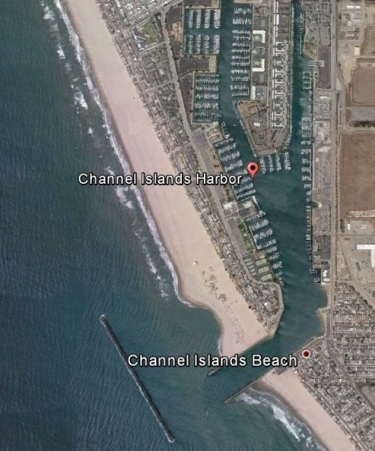 About five years ago we moved her to Channel Islands Harbor about 40mi north of MDR due to high slip fees. Now I sail the coast line up to Ventura or out to the Channel Islands. The closest Island is a full days sail out and back. Have no trailer so as far as I know she has always been kept in a salt water slip. Found an old list of contents on the boat that states her name is Red Coat originally from San Francisco. Not to fond of the name so I never used it. I keep the 4hp, two stroke, long shaft motor horizontally in the lazarette - anything bigger would be too heavy. Thanks for the great website it's been fun reading about other people with the same passion for their Dolphins and sailing. November 15, 2009 Terry sent in the following comments about his new 5 hp Honda - minor edits. A lot of things to consider when buying that new one. Mine is a Honda 5hp, 4 stroke, short shaft, alternator can be installed but not standerd equipment on this horsepower. I chose it because after looking at what is available on the market, its design , material used, and the warranty was better than the other manufacturers. Before buying it I went to the dealer and measured to see if it would fit and every thing looked good. 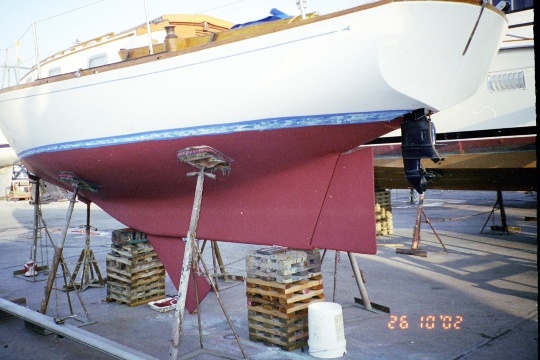 Purchased the motor and the next trip to the boat dropped it in, started it up and every thing was fine until when shifting into reverse the back of the motor was rubbing on the teak backing plate for the back stay. I removed about 3 inches from the bottom of the backing all the way to the fiberglass and it fit with no rubbing. I have never found a motor with enough horse power that could be turned in the well. Straight forward only. My choice of a short shaft was ease of installation and weight because the motor has to be removed and stored when not in use. The only other thing different from the last motor - a 4hp, 2stroke - was the idle speed is a little higher so coming into the dock takes getting used to. March 7, 2016 In response to a webmaster followup we got the following email from Terry. It has been a while. 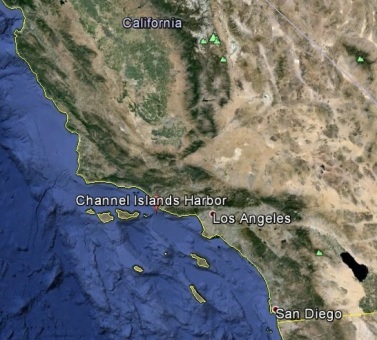 #109 is still at Channel Islands Harbor CA, but moved to a new slip with a better view. I retired a few months ago and am looking forward to spending more quality time with her. Hope to go sailing more often.